Do you pay attention to how faces are changing with age? A charming woman suddenly sees in the mirror circles under her eyes, lowered corners of the eyebrows, eyes, and lips, fallen cheeks, and ineffective curves of the body contour. Speaking the language of science, age-related changes are accompanied by an increase in the skin area and reduced amount of subcutaneous fat. These changes are particularly evident in the rapid loss of body weight on the background of a hormonal imbalance. By the way, chronic stress with a «fatigue syndrome» are only worsening the loss of volume in the face. All these states are triggering significant changes in body weight, and now against every 3 overweight patients, there are two with insufficient body weight. Such people look tired and exhausted. Similar processes occur in their bodies. First of all, the changes become visible on the breast and anterior abdominal wall. Other «areas of dissatisfaction» include inner thighs, shoulders, and hands. Age-related changes often become the reason for consultation with a plastic surgeon. For a long time, the only remedy in case of dissatisfaction with breast shape was insertion of silicone implants. However, according to the data of the U.S. Food and Drug Administration (FDA) in 2011, about 30% of the patients have to return for the second operation in the next 10 years after the insertion of breast implants. Moreover, this statistic does not depend on the brand of the endoprosthesis. We are talking about well-known and well-established brands. The idea of transplanting the patient’s own adipose tissue to replace the volume of subcutaneous soft tissue was first suggested in 1883 by German surgeon Gustav Adolf Neuber. He used the fat from the back of the shoulder in correction of cosmetic defects of the face. His compatriot Erich Lexer used this method for the correction of retracting scars. In 1953, there arose the idea of possibility of breast augmentation using the patient’s own adipose tissue as the filler. Since the 80s of the twentieth century, many authors report on the successful use of adipose transplants, for example, in the correction of facial wrinkles and aging hands. Nevertheless, the lipofilling method for correcting age-related changes in soft tissue has become widespread only about 10 years ago. The reason for the slow practical application of the brilliant scientific idea was the low engraftment of the replanted material. The possibility to use the patient’s own fat is constantly attracting attention of surgeons and patients themselves. This procedure is justified in all conditions characterized by insufficient or scarring subcutaneous soft tissue and, if desired by the patient, in order to change the contour of some parts of their body or face. The benefits of using the patient’s own tissue over the synthetic injectable fillers or implants are obvious. Clinical and experimental evidence accumulated over the past 10 years made it possible to distinguish the principles of adipose tissue transplantation procedure, compliance with which provides 70-90% engraftment of the transplanted material. Thus the main problem of lipofilling - partial resorption of fat transplanted - was solved. These principles include the most gentle method of taking adipose tissue and its correct transplantation into the prepared tissue with developed vasculature. Meanwhile, the appeal of contouring the face and the body with its own fat in aesthetic surgery is so high that lipofilling is often used without carrying about following the technology. Hence the method is discredited, though poor results of lipofilling are almost always associated only with the quality of technical implementation. So, the adipose tissue is taken in the area of the anterior abdominal wall and the inner thigh by way of microlipoaspiration with a cannula. The obtained material is washed and treated in a certain way to enhance its survival. Observation of patients in the postoperative period showed that the transplanted fat tissue decreased in the volume of 25% on average during the first year. After this the results of correction remained stable. So, the liposuction of the donor area is a nice bonus for the patient. In administering fat tissue interlayer spacing must be sufficient to maintain good nutrition of the newly transplanted cells. Thus, lipofilling in areas with a pronounced lack of soft tissue should be carried out in several stages. An example is the noticeable result of buttocks contour correction after the first treatment. At the same time, radical correction of cicatricial retraction of tissues requires 2 or more procedures precisely due to the close contact between the skin and underlying tissues. It may be necessary to re-insert fat in the facial area up to 3 times in a period of 3 months to a year. Efforts are underway to select the mode of freezing the aspirated fat to be able to repeat the filling of «small-consuming» areas without a repeated liposuction. 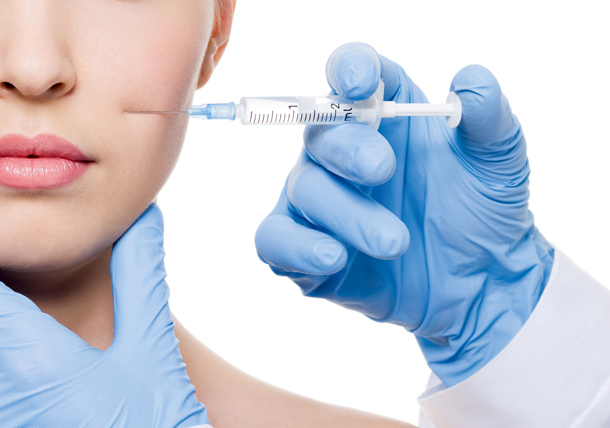 For an unbiased patient the lipofilling effect on the face is obvious, but it is much more difficult to show it in photographs than after the introduction of synthetic materials or tuck-up surgeries. At the same time, a cosmetic pump-up in cheeks, chin, and cheeks is very effective. Breast reconstruction has been popular among women around the world for decades. It is not easy to decide on such a step. But it is even more difficult to choose the right method and the doctor you can trust. Prosthetics, perhaps, can be compared with piercing. No one can guarantee that the earring inserted, even one of the best material, will never cause inflammation. It can be there for 10 years and everything will be all right, despite the illness, stress, and travel. But at one point against a common cold there may occur inflammation or rejection. Advertisement brochures do not say about the frequency of surgeries on removal of prostheses and treatment of complications. Scientific developments are progressing in different countries. Advertising of methods of breast augmentation with the use of ointments, pills, hypnosis, etc. come and go. But to date, the only viable alternative to implants could be the patient’s own fat. A sort of the «point of no return» to the conventional point of view was the emerging of the invention of a brand new method and thought-out technology making it possible to fully restore the breast. This method was proposed twelve years ago by the U.S. surgeon Roger Khouri. The technology is as follows: The patient is wearing a special plastic vacuum bra. Thanks to stretching, the tissue increases in volume due to local edema - this is the way a skin flap needed for further reconstruction or breast augmentation is grown. Specially processed fat is introduced into the prepared space. In this case, if a drop of fat is small, it survives, but if it is larger, only the outer cells of the fat graft will receive nutrition, while the rest unable to grow vessels will die. The invention of Dr.Khoury is precisely focused on the correct way to prepare the fat mass and the special way to introduce it to ensure a full survival of fat. Breast reconstruction may be required after a dramatic weight loss, breastfeeding, cancer surgeries, or injuries. There are many forms of asymmetries and anomalies of the breast well-modifiable by means of lipofilling and vacuum apparatus. The surgery is performed under local or light general anaesthesia. As a result, the breast is very close to the ideal - soft, delicate, and natural to the touch. Once the fat is engrafted, there is no risks of its rejection anymore. In this case time is for the patient. However, breast augmentation with endoprothesises is still justified for some reasons, still loved by patients, and still has its adherents among aesthetic surgeons. And it is wonderful that today women, who want to enlarge their breasts or improve its shape, have a choice between inserting implants and the new method of lipofilling or fat-grafting. If a doctor can improve the quality of life of the patient, he should do this!